Able Demolition is your first choice contractor for residential and commercial demolition projects. 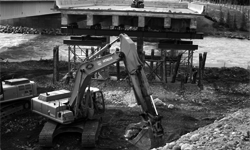 We offer complete demolition and excavation services. From start to finish, you can rely on our experienced and professional team to follow through on any challenging demolition project. We have worked with major clients in commercial and industrial construction industries. Able Demolition Services is recognized as a leading demolition contractor and has become an integral part of successful construction and infrastructure projects completed in Calgary and Western Canada. At Able Demolition, we do our best to recycle materials. We sell a variety of inventory recovered from our demolition sites, which helps to reduce waste and protect the environment. At Able Demolition, we are committed to diverting as much material from the waste stream as possible. We salvage and recycle materials such as steel, concrete, and asphalt. For more information on our recycling program, please contact us. At Able Demolition, we strive to meet and exceed Occupational Health and Safety requirements. Our health and safety training programs are mandatory for all employees, as well as compulsory personal protection equipment. We are also part of the Alberta Certificate of Recognition Program. Able is a locally owned and family-run business, founded by Hans Bernd Meyer and managed alongside his son, Ed Meyer. 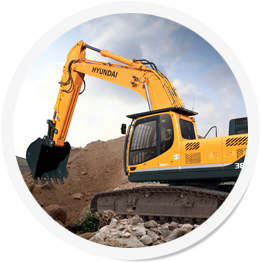 We have a long track record of success, having completed major large-scale demolition projects over the years. We offer a wealth of knowledge and experience in a variety of demolition projects, which are delivered at competitive prices and set at hourly rates or contract prices. For older building retrofits when large or small portions of buildings and structures need to be demolished. Complete interior demolition and clean-up of any size, shape or form to suit our customer’s needs. With a 40-cubic meter capacity, end dumps and tandems for trucking any type of material from concrete and rubble to dirt and rock. All types of excavation from small residential projects to large industrial and commercial jobs. 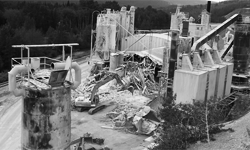 We have state-of-the-art robotic demolition tools to suit a wide array of applications. Includes, but is not limited to, asbestos abatement, PCB removal, as well as removal of other hazardous materials. From smaller robotic hammers and crunchers up to 10,000ft/lb. excavator-mounted hydraulic breakers and hydraulic crunchers and shears. We process various types of building materials and mechanical and electrical components for both residential and industrial use. We have worked with major clients in commercial and industrial construction industries. 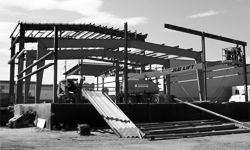 Able is recognized as a leading demolition contractor and has become an integral part of successful construction and infrastructure projects completed in Calgary and Western Canada. Whether you require demolition, trucking, rock breaking, recycling or site clean-up – Able Demolition Services is here to help. Based in Calgary, we also serve all of Western Canada. We pride ourselves on the quality of our workmanship and on our commitment to completing each job on time and on budget. We make safety our top priority on every job we do, which is why health and safety programs are mandatory for all our employees. We look forward to becoming your contracting company of choice. For more information, please fill out the form below and we well get back to you as soon as possible.